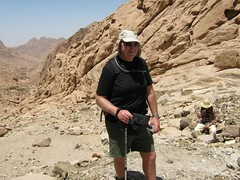 From 18th to 25th April I experienced and enjoyed God’s World in Sinai Egypt – trekking high into the Sinai and St Catherine protectorate each day for five days. High in the mountains there are wild donkeys and groups of Ibex goats. I was fortunate enough to sight the bright blue lizard, the geeko lizard, a desert rat and a desert hedgehog. My greatest blessing was to see a small white butterfly. Scientists go to Sinai to study this rare butterfly, only found in this area for four weeks of the year. Another special moment was to find that one of the pictures I took as the sun was rising on Mount Sinai (Moses Mountain) was covered with spiritual ‘orbs’. Moses Mountain is very special because of its history, and people from all over the world come to visit; but it is very tourist orientated. Something told me to take the photo at that moment, at the foot of the ‘steps of repentance’: thus I feel that spiritual presence was shown to me that day. 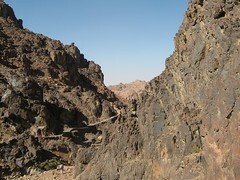 The Bedouins are themselves like mountain goats. I felt very relaxed with one ahead of me as we scrambled up the rocks – with me, in my safe walking boots, watching where his footholds were – and he in SANDALS!! 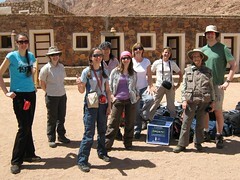 We had an English-speaking Egyptian guide, Ashray – very knowledgeable and interesting. He knew the history inside out and was also an Egyptologist. His family origin was in farming. What was amazing, this guy, with his Bedouin helpers, provided all our meals – breakfast, lunch and cooked dinner – as well as guiding us on the day treks. All we had to do was carry the lunch between us. There was always fresh bread, melons, tomatoes, peppers, feta and cream cheese, tinned peas and beans, tinned meat and fish, for lunch – and kettle boiled for tea (with herbs collected along the way). The natural growing herbs were very aromatic and there was also a thorny plant which, when dried, was very sharp. Ashray said that was what Jesus’s ‘Crown of Thorns’ was made from. It was the trip of a lifetime, and when up in those mountains time stood still. It was the same as thousands of years ago. The money I raised through sponsorship for this trip will go to Siloam Christian Ministries, which helps to bring aid and compassion to some of the poorest and most disadvantaged people in the world. My journal of the trip is available as a hard copy and as a disc: these are both available for circulation in our church. If you would like an email copy, click here, and I will send it to you in four parts.